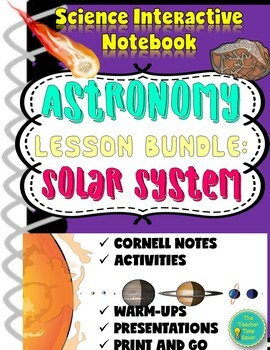 This Astronomy Unit Bundle focuses on the Solar System and includes five lessons. Each lesson comes with a set of Cornell notes (differentiation provided), an activity, a presentation, warm-up, and a mini quiz built into the presentation. This product is part of my COMPLETE UNIT BUNDLE: Astronomy Unit 2: Solar System. This product is part of my Astronomy Mega Bundle (Units 1, 2, and 3). Want it all? Check out my Earth Science entire year bundle! ★Anticipation Guide: Ten true or false statements help identify what students know, what they think they know, and what they will learn. A presentation follows along printable lesson. An answer key is provided. Each anticipation guide question follows their according Cornell and presentation to review the answer and acts as a warm-up. ★Cornell notes: There are two versions--filled and fill-in-the-blank. Notes are completed by following along with the presentation. This allows you to walk around and support students, engage with students, or sit comfortably in your seat. There are five criteria to the Cornell notes: header, student notes, drawings of main ideas, summary, and student-derived question (Depths of Knowledge). ★Presentation: Presentation guides direct instruction as students follow along and complete their Cornell notes. Presentation revisits anticipation guide statements from the beginning of the lesson and at the end (serves as warm-up), has built-in mini quiz at the end of each lesson to check for understanding (5 multiple choice questions with answers), pictures to help learn the material, and starter sentences to support students complete the summary section of their Cornell notes focused on the essential questions (differentiated instruction). This is a PDF file and is not editable. ★Activity: An activity follows the Cornell note in order to support and reinforce students' understanding of the content and provide students an opportunity to think critically by creating something new with the input received from the notes. There are five criteria: written portion, art, color, reflection, and an “excellent" component to encourage students to do a quality piece of work. ★Grading: Each criteria is worth one point making each Cornell and activity worth five points. For easy grading, simply circle missing components or stamp to designate full credit. As a teacher, I am out the door after the bell rings and I do not bring any grading home. I truly am the teacher time saver! 2. If you purchase this product and the unit bundle, please note you will be purchasing duplicates so buy the bundle and save time and money! 5. This product is not editable unless noted otherwise (students templates for project, table of contents, score sheet, and unit cover). 6. This product is part of the Astronomy Unit 2: Solar System. If you purchase this product and the unit bundle, you will be purchasing duplicates. Buy the unit bundle and save money!